This morning, I will attend the Inaugural Ceremony for incoming County Judge J.D. Salinas. The event is being held at the UTPA Student Union. It should be a nice event. I'll try to take some pictures. The event had a pretty good turnout. 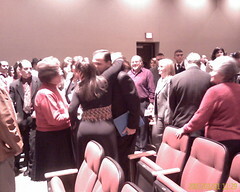 Much of the auditorium was filled. 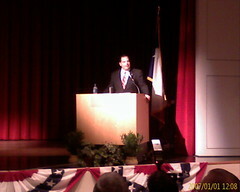 Here is JD Salinas greeting the audience as he makes his entrance. 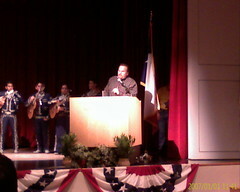 Oscar Garza was the Master of Ceremonies of the Inaugural Ceremony. He kept the crowd entertained throughout the event and was quick to recognize other officials present. 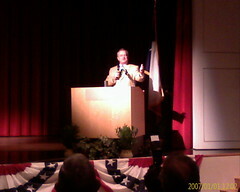 John Sharp, the Texas Comptroller, had some kind words to say about his friend and former employee JD Salinas. Finally, JD got a chance to speak to the audience. He shared how he will approach the work that lies ahead. 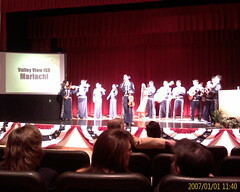 We had music from the Valley View High School Mariachi throughout the event. They played remarkably well. They are good performers.